Gel-Paste and Cream Hand Cleaners There are 2 products. 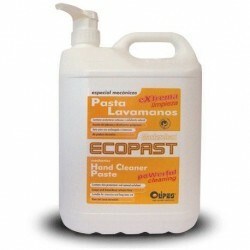 Masterclean Eco Past is a biodegradable semi-liquid handwashing paste for intensive professional use, with a natural scrub to remove extreme soils without skin irritations, typical of gel-type industrial soaps or with abrasives and solvents. Masterclean Hand is a handwashing gel for intensive use by mechanics, with lanolin and softener. Due to its balanced composition, it has applications in a wide range of fields and activities: industry, workshops, hostelry, schools, barracks, etc.. This site uses its own and third-party cookies to perform the analysis of navigation and thus improve your experience on our sites. If you continue navigating, we consider you accept its use. You can get more information here.